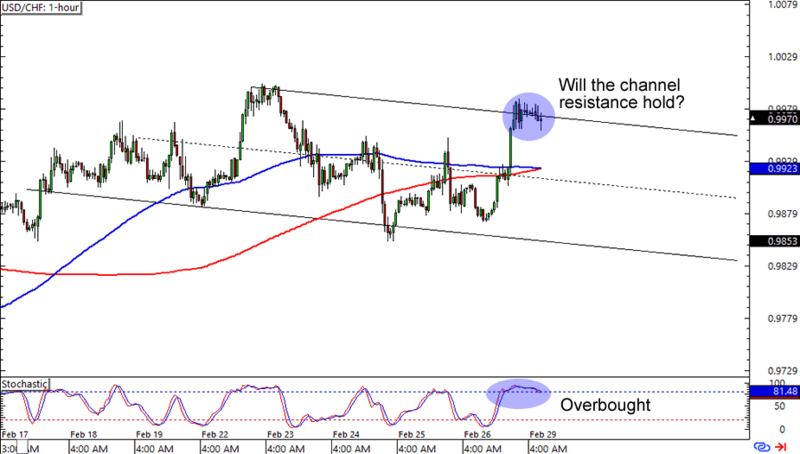 First up for the week is an easy peasy downtrend setup on USD/CHF. The pair is hitting resistance at the .9970 area, which forms a falling channel with the previous high on the 1-hour time frame. Not only that, but Stochastic is also flashing an overbought signal. Think we’re about to see dollar losses against the franc today? A short trade around current levels could get you a decent reward-to-risk ratio, but you could always wait for an upside breakout if you’re one of them dollar fans. Here’s one for countertrend comdoll traders out there! USD/CAD looks like it’s bouncing from the 1.3500 major psychological area, which is right smack at a falling channel support on the 1-hour time frame. Countertrend trading is not for everyone, forex warriors. 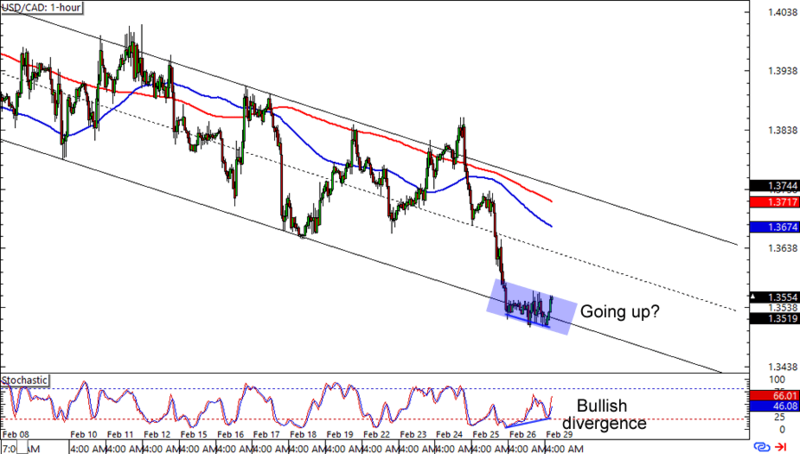 If you’re still planning on trading this one though, then you could take advantage of the bullish divergence on the chart and put on a long position aiming for the channel’s highs. Just make sure you fill up your trading plan with contingencies for different market scenarios! 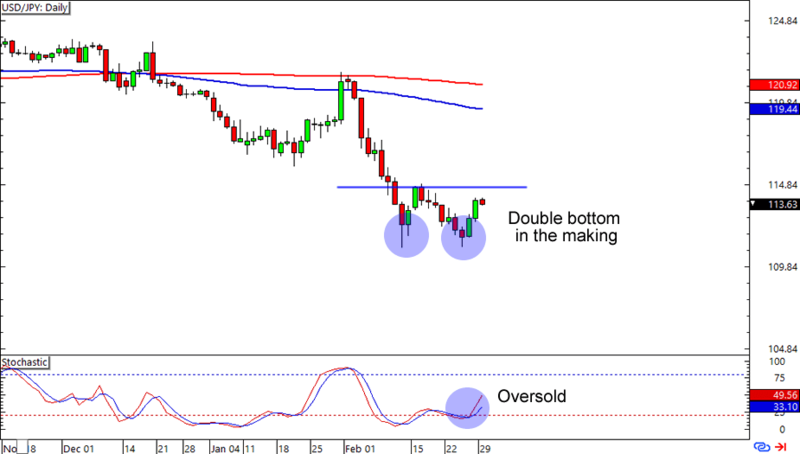 Last one up for today is a potential double bottom, this time on USD/JPY’s daily time frame. The pair bounced from the 111.00 major psychological handle, and could be headed for the neckline around the 115.00 levels. Stochastic is also on the bulls’ side with an oversold signal, though you could probably wait a bit for an actual breakout if you’re not too sure about selling the yen just yet. What do you think? Will we see a reversal for USD/JPY? This is the true story of one man, picked to live in front of his computer screen and find ways to make money from trading money. See what happens when markets stop being polite and start being real! Using charts, I show how current currency price action is playing out and chart patterns forming.